It all began in far-off 1970 with the commitment and enthusiasm of a wine-grower who firmly believed in his dream: to promote both the typical wines of Usini and his region with its unique features. Far-sighted and wise, and supported by a passionate desire to know and experiment, the patriarch Giovanni Cherchi brought an ancient native grape species, Cagnulari, to the fore once more. Giovanni Cherchi is considered a pioneer of Sardinian viticulture and winemaking, not just because he rediscovered Cagnulari, but also thanks to his work to improve the qualities of Vermentino. He was one of the first to launch “Vermentino di Usini” on the market with a clear identity linked to its area of origin. Driven by a passion for the land. Despite the success achieved, we remain true to our roots and consider ourselves first and foremost winegrowers; protagonists of each production phase, from the vineyard to the bottle, and custodians of this farming, cultural and human heritage. Today, we still safeguard and promote the environment in which our wines have originated: an intertwining of fragrances and sensations of wind and sun, of land and people. A land that tells of wine and features wine in its most beautiful, fascinating stories. There is a hospitable village in north-west Sardinia that has always been known as the “place where they make good wine”. Usini is a municipality of the province of Sassari, nestled in the Logudoro hills. These lands have a centuries-old vocation for grape-growing, with their alternating limestone hills and valleys clothed by a patchwork of vineyards, olive groves, vegetable gardens and pastures. The particular features of the soil and climate provide us with full-bodied, fragrant grapes. Sea breezes, due to the short distance from the coast, the wind and temperature excursions enrich the organoleptic characteristics found intact in our wines. Knowing how to be patient is the secret for achieving great objectives. Our vineyards lie on the hills of Usini, 200 meters above sea level. 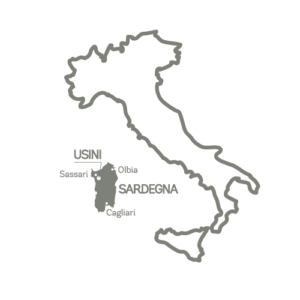 The company estate spreads over some 30 hectares, 60% of which devoted to Vermentino, 35% to Cagnulari and the remainder to Cannonau. The vines are mainly vertical trellis-trained with Guyot pruning. Our vineyards grow on land with a variety of soil compositions: more limestone on the south-east slope, with clay soil prevalent in the north-west. This gives our grapes different characteristics that enable us to obtain balanced, round wines. On the hills of Usini, 200 meters above sea level. We work in tune with nature’s rhythms. We tend our vines from pruning to harvest, aligning ourselves with the seasons and the rhythms of nature. Thanks to the professional skill and experience stemming from our long-standing grape-growing tradition we are able to use plant protection products sparingly, so as to safeguard the environment and the unique features of our grapes. Environmental sustainability lies at the heart of our way of living and working. This is our contribution to improving our territory. With the same philosophy of respect for nature and its fruits, the grapes are collected in the modern, efficient winery surrounded by the vine rows, equipped with state-of-the-art processing, aging and bottling equipment. In the underground cellar, excavated from the rock, our finest wines mature in oak barrels.